Ohh.... Tq Q1. Prove that( cosecA - sinA) (secA - cosA) = 1/ tanA - cotA. The angle of elevation of the top of a tower from certain point is 30°. If the observer moves 20m towards the tower, the angle of elevation of the top increases by 15°. Find the height of the tower. The angle of elevation Φ of the top of a lighthouse as seen by a person on the ground is such that tanΦ = 5/12. When the person moves a distance of 240m towards the lighthouse, the angle of elevation becomes Φ, such that tanΦ=3/4. Find the height of the lighthouse. The length of the shadow of a tower standing on ground level is found to be 2x m longer when the sun's altitude is 30° than when it was 45°. Prove that the height of tower is (√3 + 1)x m.
Sunita is an electrician and she has to repair an electric fault on a pole of height 5m. She needs to reach to a point on the pole 1.3m below the top of the pole to undertake the repair work. What should be the length of ladder that she should use which, when inclined at an angle of 60° from the horizontal, would she enable her to reach the required position ? Further how far from the foot of the pole should she place the foot of the ladder? What value is indicated from this question? A spherical balloon of radius r subtends an angle Φ at the eye of an observer. If the angle of elevation of its centre is Φ , then find the height of the centre of the balloon . A bird is sitting on the top of a tree which is 80 m high. The angle of elevation of the bird from a point on the ground is 45°. The bird flies away from the point of observation horizontally and remains a constant height. After 2 s, the angle of elevation of the bird from the point of observation becomes 30°. Find the speed of flying of the bird. 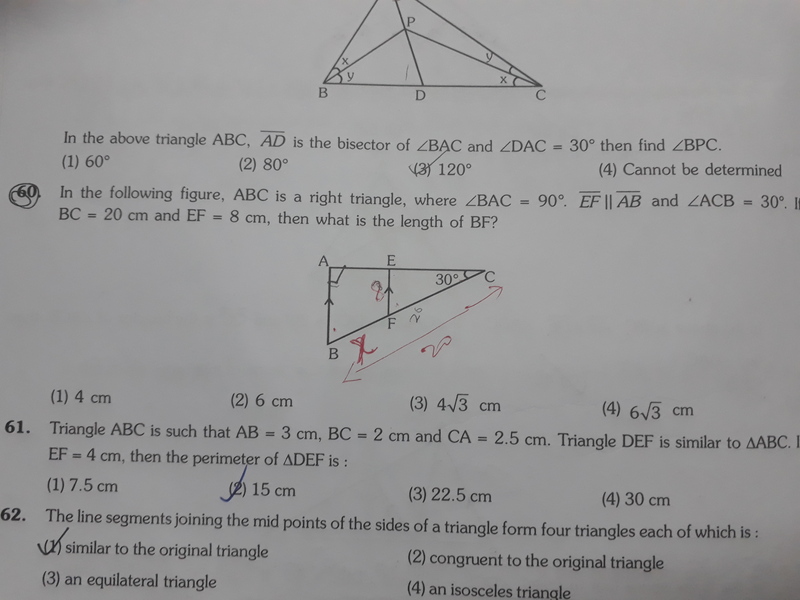 QID : 65 - In a triangle the length of the side opposite the right angle is 9√3 cm, what is the length of the side opposite to the angle which measures 30 degree? if cot theta= 1/ root 3, show that 1-cos square theta/ 2- sin square theta = 3/5. ABC is a right triangle at right angled at A and AD is a median. BA is produced to E such that AB = AE and join ED. AB = 6 , BC = 10 cm , find the artea of triangle BED? If secx+tanx=4 ,find the value of sinx ,cosx, secx and tanx? If cosec theta . cos( theta + 54) = 1, find the value of theta so that theta and (theta + 54) are acute angles. the angle of elevation of the top of a hill at the foot of a tower is 60 degree and the angle of elevation of the top of the tower from the foot of the hill is 30 degree. if the tower is 50 m high, what is the height of the hill? In triangle ABC, AD is perpendicular to BC. Sin B = 0.8 , BD = 9 cm and tan C = 1. Find the length of AB , AD , AC and DC . In ∆ABC,m∠B=90°,AB=7cm and AC-BC=1cm.Determine the values of sinB and cosB. the upper part of a tree broken by wind,falls to the ground without being detached.the top of the broken part touches the ground at the angle of 38degree30min ata point6m from the foot of the tree calculate 1. the height at which the tree is broken. Lim x->0 (tan x- sin x)/x^3=? Can you explain this question in shortcut way? How to solve sum iv) ?? Please solve - A balloon moving in a straight line passes vertically above two points “A" and "B" on a horizontal plan 1000 mt apart. When above “A” it has an altitude of 600 as seen from “B” and when above “B” it has an altitude of 450 as seen from “A”. Find the distance from “A” of the point at which it will touch the place when it comes down vertically. Is cos(|sin x|÷x) not defined at x=0? cosA - sinA+1/ cosA+sinA-1 = cosecA+ cotA Solve the above. Page 377 Ex 6 If ∠A and ∠B are acute angles such that cosA=cosB, then show that ∠A = ∠ B. Evaluate the term cosec . Find all trigonometric ratio for the angle 30 geometrically. If sin A-cosA= then find the value of the following. tan1 tan2 tan3 ............tan89=1 what is the probability that a leap year selected at random will have 53 sundays if the polynomial x^4-6x^3+16x^2-26x+10 is divided by another polynomial x^2-2x+k gives reminder x+a . then find a and k.
answer of this question wid step wise explanation. How to evaluate without tables? The angle of elevation of stationary cloud from a point 25 cm above the lake is 30°and the angle of depression of its reflection in the lake 60° what is the height of the cloud above that lake level. If sec A + tan A = p , then find cosec A. What is the value of (cos267° - sin23°)? In fig 8.13,find tan P-cotR.